Can they be controlled in a warming world? Record-setting heat and intense drought have made 2012 one of the worst wildfire seasons in a decade of intense fires. Climate change, residential development in fire-prone rural areas and the impact of past firefighting policies have combined to put many areas of the United States at risk, especially in the West. Federal agencies spend more than $2.5 billion yearly to control wildfires, and the cost is rising. Scientists widely agree that fire plays an important ecological role, and federal land managers are working to reintroduce fire in controlled settings to regenerate forests and reduce combustible brush that can cause wildfires to burn out of control. Public officials are under heavy pressure to fight fires that threaten homes, but few are willing to make homeowners bear more of the costs to protect their property. 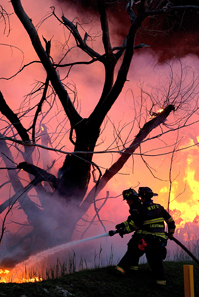 Using fire-resistant building materials and clearing brush around homes can reduce fire risks. Some advocates want to go further and bar new development in fire-prone areas.